Let’s face it, if Bigfoot showed up at your house and demanded that you feed him immediately, you would need to whip out a tasty, simple meal with big flavor in no-time flat. That’s the way that I like to cook, especially on weekdays after coming home from school. 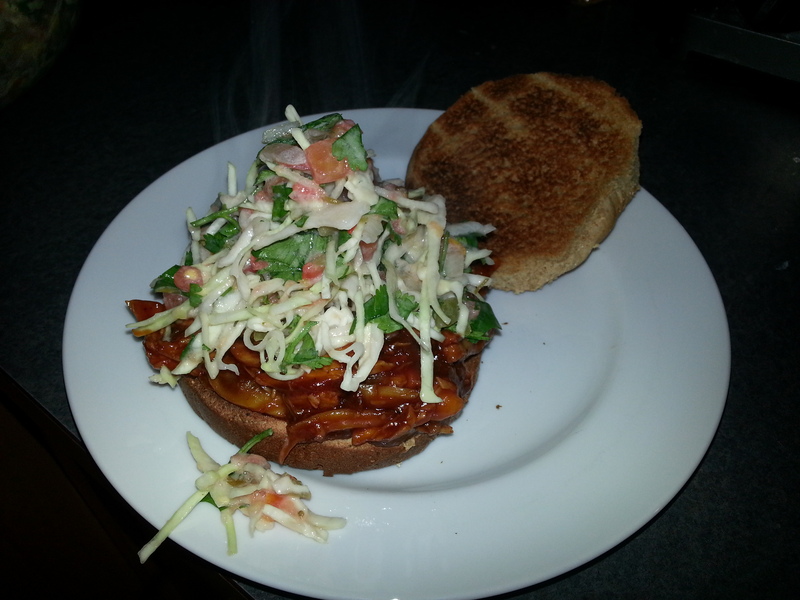 That’s why we’re starting with something simple: Pulled BBQ chicken sandwitches with salsa slaw. There are a few ways that you can do the BBQ chicken, and my favorite methods for this recipe are to use either leftover beer-can chicken, or leftover barbeque chicken breast. If you don’t have either of those, you can always cook your own, or pull a rotisserie chicken from the store. Given that there are only two of us, we often opt for the last method, as it’s a good way to get two full, easy meals out of just about $6.00. This week, I ended up pulling a chicken, and dividing the meat in two. The first portion was used for this recipe, and the second will be used tomorrow for fajitas or some other such dish. Pour 1/2 tablespoon of olive oil in your pan (I use a small soup-pot for this, becasue it’s nice to stip the mixture in), and let it heat up over medium heat. 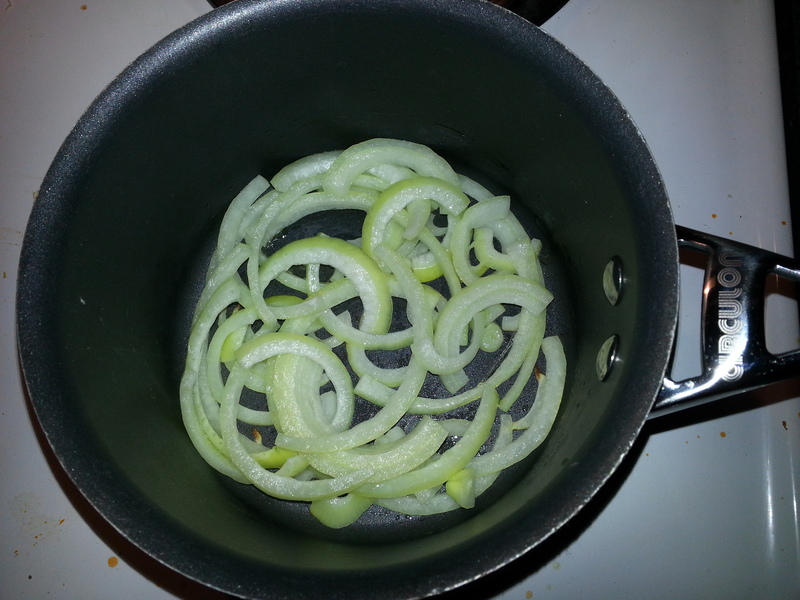 Add the onions and allow them to cook, stirring frequently, until semi-translucent, about 5 minutes. If you like less onion-flavor continue cooking for longer. Rough chop the chicken, and add to t he pot with the onions and bbq sauce. Cook over medium-low heat. Add sauce to taste. 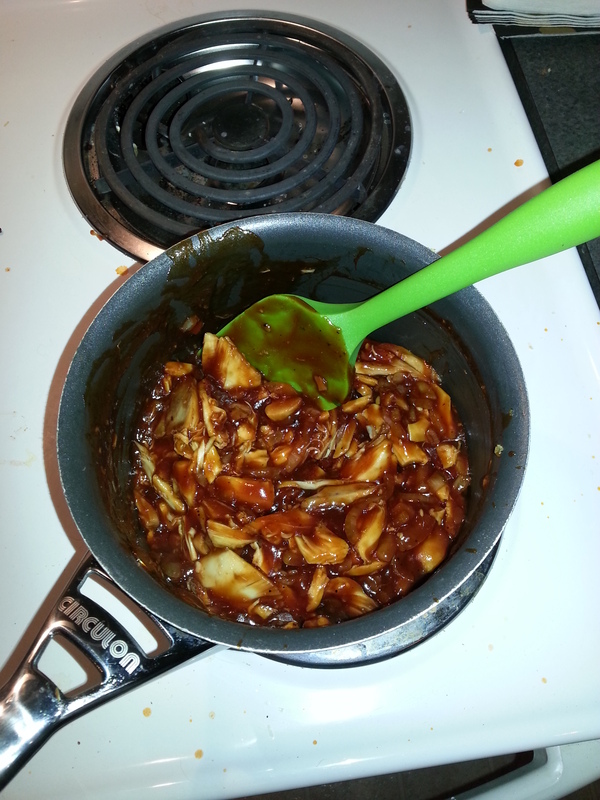 Stir frequently, allowing the sauce to cook down, giving the mixture a nice, sticky texture. This cooking process will break the chicken down, and allow some of the moisture to cook off. Toast the buns before serving out the chicken. Shave the cabbage into a medium mixing bowl. Chop the fresh cilantro, and add to taste . I LOVE the taste of cilantro, so I tend to add more than most – about 1/2 a cup. 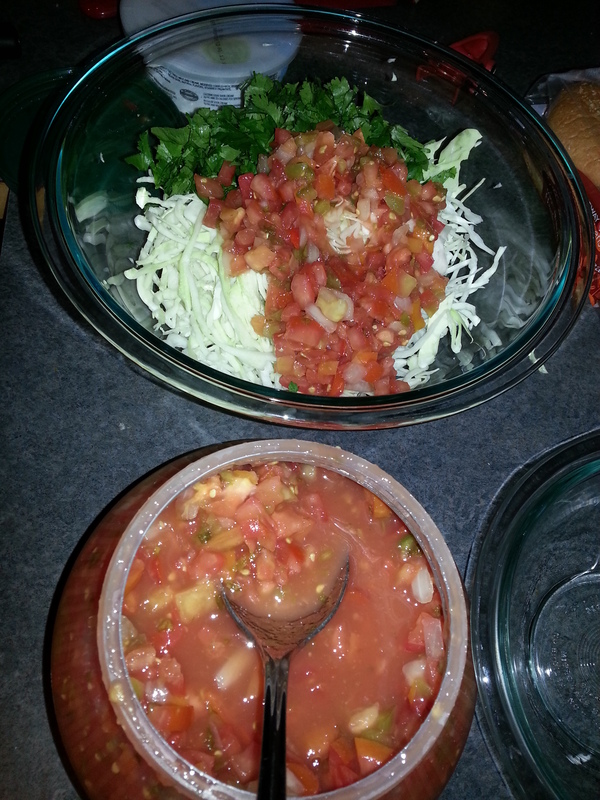 Scoop fresh salsa into the mix with a slotted spoon, allowing the excess water to drain out before dumping it into the cabbage mixture. You could use homemade salsa for this as well, but since it’s being mixed with other things, the fresh, chunky kind from the grocery store works really well. Any extra water will pool at the bottom after mixing, and make the buns and the bowl sloppy. 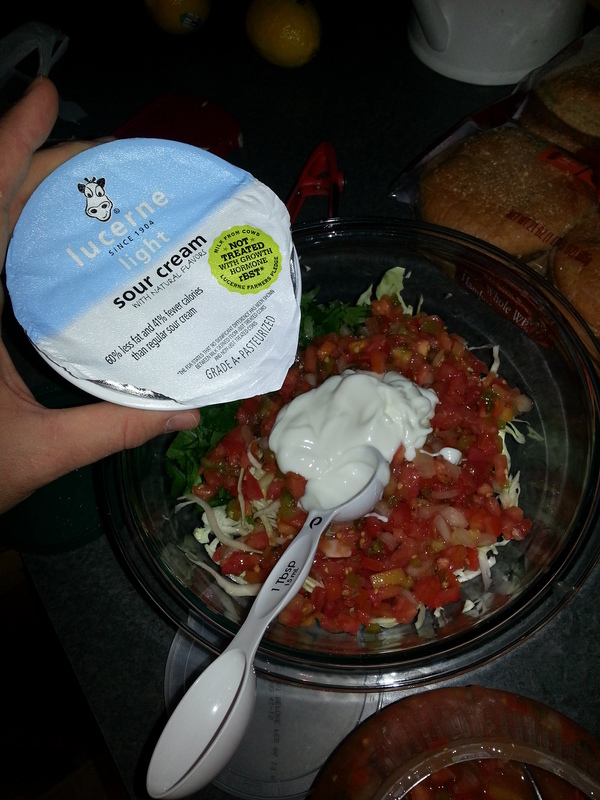 Spoon in two tablesppons of sour cream, and mix well. Serve the chicken out onto two buns, and top with slaw. My wife and I enjoyed ours with a crisp Light Honey Ale that I made recently. Enjoy!